Healthy Peach Cobbler Recipe – A Simple Raw Food Dessert Recipe! 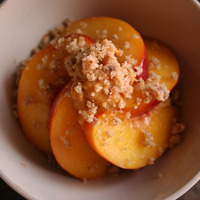 You are gonna love this simple no bake healthy peach cobbler recipe, donated by Julia Corbett. She is the author of Sweet & Raw Pie Mandalas, a superfood dessert recipe book, and owner of Diviana Alchemy. It’s a simple and fresh raw dessert recipe that can be modified to use any type of fruit you like! Slice and pit peaches and set aside. Place dates, coconut, almonds and a pinch Himalayan salt into a food processor and mix until combined and sticky. Set aside. Blend only ½ cup of peaches with vanilla, honey, and coconut oil in the blender until smooth. Layer all components in a glass dish or in individual serving cups. Please let me know if you try this recipe and what fruit you use. I’ve also tried it with mixed berried (strawberries, raspberries, and blueberries) and it worked great! P.S. There are still a few more days to get the ground breaking e-book, What do Raw Fooders Eat? Click here for more info! I just made this and it is amazing. I put the dates, coconut and cashews (did not have almonds) in bottom of pie plate like a crust (after putting into food processor). Then put the rest on top. Very good. Thanks for the recipe. Hi Monika, this is wonderful news. Thank you! I bet the rasberries really added a nice touch.